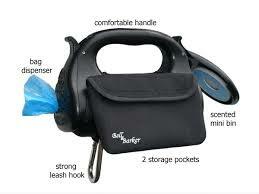 A innovative gadget that will stop you from ever getting caught swinging a dirty bag of dog waste on your walks again. CINCINNATI - Feb. 8, 2016 - PRLog -- The British invention Leashpod has started a Kickstarter campaign preparing for its launch into the U.S market.
. Parks services and municipalities around the country have long struggled trying to get dog owners to clean up after the dogs. People hate to carry around a dirty dog bag during their walks. Picking up after your dog just got a whole lot nicer. Amazingly, millions of dog owners take to the streets carrying the dirty bags in their bare hands.
. The biggest challenge is simply product awareness....consumers now have a choice "Either swing the dog poop in your hand or pod it". Leashpod comes in small and large to accomodate most dogs. : The Vet's Daughter L.L.C. American dog owners are willing to carry their dogs poop in their hands? Do Park Goers Hate Your Dog? Dog Owners Need To Pick It Up.